Looking for Switchboards? Get a quote fast. The NEC describes a switchboard as “a large single panel, frame, or assembly of panels on which are mounted, on the face or back, or both, switches, overcurrent and other protective devices, buses and usually instruments.” Essentially your switchboard, also referred to as an electrical main switchboard or a distribution switchboard, is your distribution center. Distribution switchboards can supply electricity to several panelboards which then deliver electricity to specific circuits/collection of circuits, but not vice versa. Switchboards also utilize both horizontal and vertical bus, with horizontal bus delivering electricity between different sections of the switchboard, and vertical bus distributing power throughout the different branch circuits. As far as switchboard enclosures go, switchboards always come enclosed, and are built and designed across a number of NEMA ratings, so they can be installed both outdoors and indoors. When looking to buy a switchboard, it’s helpful to know some of the following. Switchboards are always 3 phase. Switchboards are also relatively versatile in that they can be either floor-mounted or wall-mounted. Switchboard designs also allow for both front and back access. Further, a large majority of switchboards are modular switchboards, composed of individual cubicles that are then composed of switchboard modules. Each of these cubicles can be custom configured and designed, removed and emptied, depending on your exact specifications. 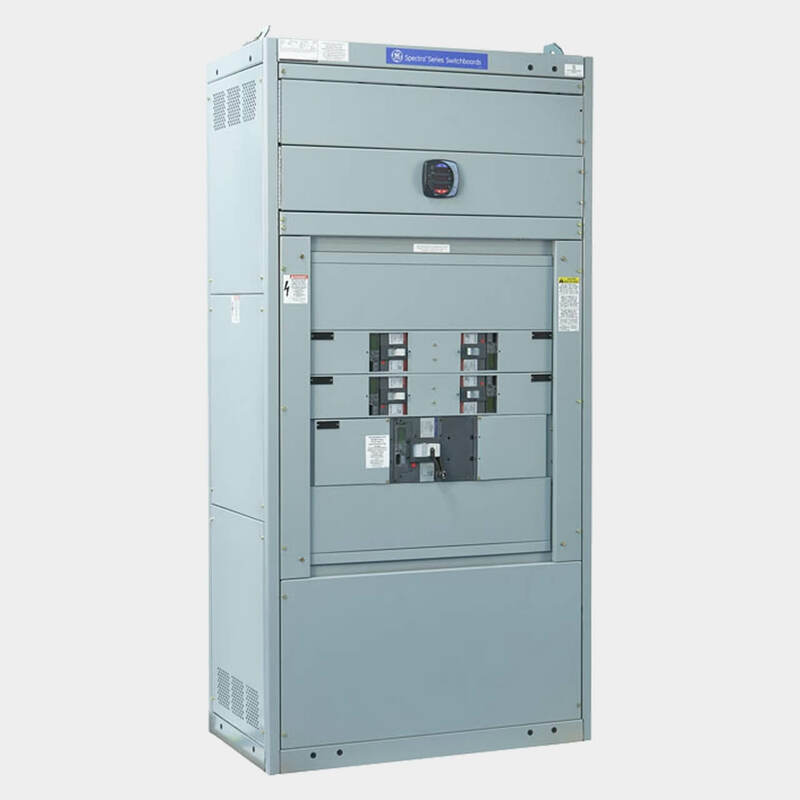 With amp ratings ranging from 1200A to 5000A, switchboards are used for both AC and DC currents for a variety of industrial and large commercial applications. Due to their large size, switchboards can accommodate larger breakers like insulated case circuit breakers. On the hunt for a new power switchboard? We’re proud to carry a huge selection of switchboard types including distribution switchboards, AC switchboards, electrical main switchboards, cubicle switchboards, modular switchboards and more for a variety of industrial and commercial applications. Whether you’re looking for a new switchboard or something reconditioned, we’re sure you’ll find exactly what you’re looking for. Take your pick from top switchboard manufacturers including Eaton, Siemens, GE, Schneider, Cutler Hammer, Merlin Gerin, and more. Have any old or unused Switchboards lying around? Don’t get rid of them just yet. While we stock a wide range of quality electrical products and solutions, both new and reconditioned, we also buy back your unwanted equipment. So, before deciding what to do with your old Switchboards and components, have one of our expert technicians take a look to see if we can save a few parts, save the environment, and save you some cash. Great service shouldn’t end after the purchase. We pride ourselves on the relationships we build with our customer-first mentality and the quality of our Switchboards and components. That’s why we offer a 1-year replacement warranty on all of our electrical products and solutions from the top manufacturers. Because when you buy with Bay Power, you buy with confidence. We are proud to stock a variety of competitively priced, new and reconditioned components from the leading manufacturers of Switchboards. Thanks to our extensive inventory of Switchboards and components, our resourceful and expertly trained staff will always be able to get the products that you need. Through our extensive network of suppliers, we are able to carry and acquire a huge variety of electrical products and solutions, so chances are if you need it, we can get it. Bay Power’s priority is providing you with reliable, high quality electrical hardware. That’s why our mission is to make sure our reconditioned electrical products and solutions function as perfectly as the day they were built. Because while the quality is high, the cost of Switchboards shouldn’t be. Our selection of new surplus Switchboards may not arrive brand new in a box, but they function just as well, and have never had electricity run through them. All of the quality, none of the packaging, always with our 1-year replacement warranty.